Inline skating increases your heart rate and gets your lungs working, both components in aerobic exercise. You can increase these aerobic benefits by skating on an incline, skating more vigorously, or practicing interval skating. Aerobic exercise improves the cardiovascular system, reducing the risk of heart disease, stroke, and high blood pressure. Inline skating is about dynamic balance, or balance while your body is in motion. By starting with the basic inline skating skills then learning to do more advanced moves on your skates, such as skating backwards, crossover turns, inline hockey, aggressive skating, and even yoga, you can challenge your balance, coordination, and agility. Postural, abdominal, and back extensor muscles, get a great workout while inline skating. With each push and glide motion, the core is activated to support the whole body providing stability allowing for dynamic balance. A strong core contributes to the effortless look a practiced skater demonstrates. Inline skating at 10mph on a regular basis not only burns about 6 calories a minute, or 360 calories an hour, but also turns fat into muscle - a double benefit. Also, the faster you skate, the more calories you’ll burn per minute. While skating has the bone density enhancing benefits of being a weight bearing activity, the smooth push and glide motion has minimal impact on the joints. Probably the greatest fitness benefit of all is that inline skating is fun and gives you a sense of accomplishment as you tackle new fitness challenges. There are so many great inline skate events around the country in which to participate; from races to tours to local skate nights to so much more. Get out there and have fun getting and staying fit! See our different skating packages here. Official Distributor of Globe skateboards, now in stores! Inlinex is proud to be the official distributor for Globe skateboards. Carrying a full range of street skateboards, cruisers and long boards at the most competitive price in the world. Founded in 1985 by Australian skateboarding champions, Globe caters to the skateboard, street fashion and work wear markets. Specializing in purpose-built apparel, footwear and skateboard hard goods, its products sold in more than 100 countries worldwide. The Globe Chromantic Cruiser provides the ideal stability at high speeds to carve with responsive turning. This cruiser is chosen to appropriately fit styles such as fast downhill lines to cruising, carving, and street skating. The Globe Tracer Classic Bamboo 31.25 complete skateboard offers the right balance of stability and maneuverability to get you there in style. With a flexible bamboo construction, you'll get a much more playful ride than your average maple deck. SIZE (length x width x wheel base) 31.25" x 8.25" x 16.5"
The Globe Kona Fiberglass is a super thin, light-weight mini cruiser with a fiberglass and maple sandwich construction and clear broadcast grip. The Globe Bantam Graphic version is the ultimate plastic cruiserboard, with a more grippy soft-touch finish. With much wider trucks and components that last longer than anything in the market, the Bantam Graphic is the choice for you. For more cruisers and our full collection, click here. The Globe Prowler Bamboo longboard has a drop-through shape with a gradual swallow kicktail that provides great control while eliminating wheel bite. Its bamboo construction gives the board a superior flex and strength. TRUCKS Reverse kingpin Slant 180mm trucks. The Globe The All-Time cruiser comes with a high-rebound urethane formulas are abrasion resistant, smoother, faster, and provide excellent grip. Ideally chosen to fit styles from fast downhill lines to cruising, carving, and street skating. The Globe Geminon Kick 37.5" complete longboard has a symmetrical twin shape with small kicks at each end for added options when freeriding. Drop through mounted trucks increase stability by lowering your center of gravity, and a thick 9-ply construction promises speed-stiff response. This is a great entry-level board for those looking to progress their abilities and expand their skill set. The Globe Pinner Complete longboard features a long pintail shape with a kicktail, allowing for more responsive turns. Globe’s high-rebound urethane formulas are abrasion resistant, smoother, faster and provides excellent grip. 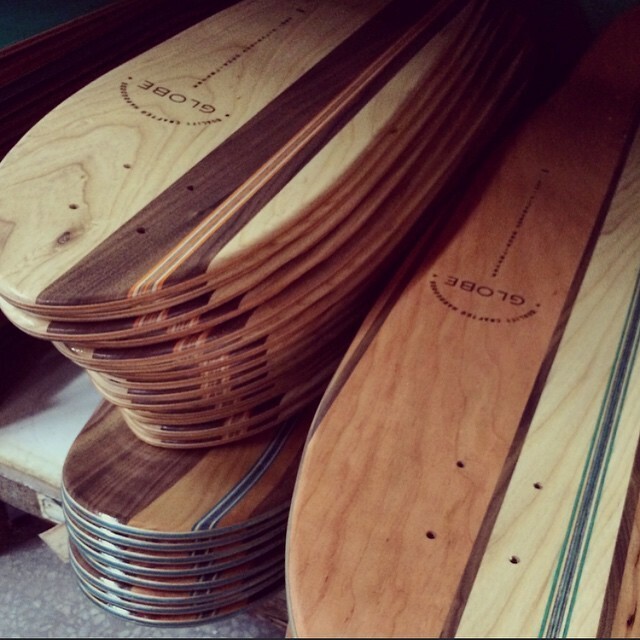 For more long boards and our full collection, click here. Shop online or in stores for the full range of street skateboards, cruisers, longboards 23" - 44" from $159. 2015 Skate Camp - Nov/Dec Holidays! We have just kick start our ever-popular Indoor Skate Camp during the November school holidays and we would like to thank everyone for the overwhelming response! Arriving bright and early our young skaters come into the store (those who registered for the earliest slot at 10:30am) to gear up and have a crash course in inline skating basics. In this crash course, our instructor-to-student ratio is kept low at about 1:5 to ensure there are always enough of our dedicated instructors to go around. Each student will receive adequate attention from our dedicated instructors and can progress their learning at a good pace. A five day inline skating course for beginners, covering all the essentials you'll need to find your skating feet. The sessions last 1.5 hours each. Session slots are in the morning, afternoon and evening daily. Where Our Riverwalk (Clarke Quay) indoor skating rink and retail space. It's fully air-conditioned, keeping everyone comfy and fresh during lessons, rain or shine. Do note that all INLINEX lessons are Results Guaranteed (if not we will redo the course, on a weekend at the same location until he/she learns to move and stop, absolutely free)! For more information on our Skate Camp, whatsapp or call 81233425 or follow our facebook page for updates! The next skate camp will be in March/June holidays. Limited slots available and slots are filled according to a first come first served basis. Do stay tune for updates on our site and FB! Start here and read the buyer's guide to choose the perfect skate for you! If you are thinking about getting into the sport for the first time or even upgrading your current skates, below are some key things you need to know in order to select the perfect skate. Comfort and performance are what defines a good skate fit. The ideal fit has your toes lightly touching the front of the boot while the rest of the boot feels like a semi-firm handshake around the foot. This snug fit will get a little looser as you break in your skates over time. Going too big or too small on your inline skates can create fit problems in the long run. A sloppy fit delivers poor performance and a skate that fits too tightly can cut off circulation. While inline wheels have grown over the years, the thought process that “bigger is better” doesn’t always apply. Wheel size should be based on skater ability and skating style. New skaters who are getting comfortable on their inline skates will appreciate smaller (78mm) wheel configurations or Hi-Lo (84mm/80mm) setups. More experienced skaters that use skating for a workout tool will utilize a bigger wheel (84mm) that allows for higher speeds. Advanced skaters looking to maximize speed, gravitate towards larger wheels (90mm, 100mm, or 110mm/100mm Hi-Lo configurations). For advanced urban skaters requiring more freestyle performance, we recommend a wheel size of 80mm to blend speed with optimal maneuverability. Aggressive skaters who demand specialized performance for the ramp, park, or street require skates with smaller wheels; the K2 Unnatural comes with a 60mm wheel setup but can accommodate a maximum wheel size of 61mm. There are two types of bearings found on inline skates; ABEC rated bearings have set the standard since day 1 and ILQ bearings are designed specifically for inline skates. ABEC bearings are rated at ABEC 1, 3, 5, 7, and 9. A general rule of thumb for ABEC bearings is the higher the number, the tighter the tolerances, which leads to higher speeds and a smoother roll. ILQ bearings come in many configurations and are geared towards the high-end skater. ILQ bearings differ from ABEC in that ILQ bearings feature 6 balls instead of 5, which increases load rating. Do you wear a seat belt when you drive? Do you use eye protection when you use power tools? Do you wear pads and a helmet when skating? You should’ve answered yes to all three. Smart skaters wear protection, (helmets and wrist guards at a minimum) to ensure that high abrasion areas are covered. The design of today’s pad sets create protective gear that is light, ventilated, and breathable, keeping you comfortable in a pad set that fits like a second skin. Remember, the right fit is key to any pad set and helmet. Make sure your gear has a snug fit and doesn’t shift while skating. Get your skates now at Inlinex Skate Shop!